The Brown County Humane Society is committed to providing care and finding wonderful families for homeless pets. Because of generous donors, we are able to rescue, rehabilitate and rehome hundreds of pets every year. 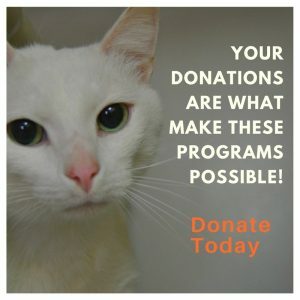 You can make a difference for animals in our community! Click on the Donate button below to offer much appreciated support right now. You may wish to have your donation used for specific purposes. Designated donations can go to the following funds. Be sure to list your preference in the “Special instructions for this donation“ comment section when you donate online or send a note with your check. Memorial Donation: Make a donation in memory of a loved one or the loss of a special pet. Write “In memory of [name]” under the special instructions section online or send a note with your check. If you would like a notice sent to the family of the person or pet you are honoring include that information with the note. Honorary Donation: Make a donation in honor of someone for a special occasion or achievement. Birthdays, graduations, weddings, Mother’s Day, Valentine’s Day, etc. Write “In honor of [name]” under the special instructions section online or send a note with your check. If you would like a notice sent to the family of the person or pet you are honoring include that information with the note. Medical Fund: Specific fund set up for shelter pets with extraordinary medical needs, such as broken bones, heartworm treatment, etc. SPOT Fund: Help support our community outreach program, SPOT (Serving Pets Outreach Team). Donations to this fund will provide low cost spay/neuter to assistance to Brown County residents and assist needy families to feed and care for their pets. Sponsor a Pet: If there is a particular pet at the shelter that you really like, but just can’t adopt. Consider sponsoring the pet (minimum $50). Endowment Funds: Endowment funds are designated for specific purposes. The core of the investments are left intact and any interest earned is used to provide funds for the specified purpose. This allows your gift to be used in perpetuity. The Brown County Humane Society has two endowment funds. Promise Fund – is an endowment fund set up specifically to fund the general operations of the shelter. Click here to learn more. SPOT Endowment Fund: is an endowment fund set up specifically to fund the the activities of the SPOT program. Click here to learn more about the SPOT program. If you have questions or would like information about making a donation, please contact us using the button in the lower right corner of this page. Our federal tax I.D. # is 23-7276105.